This soap from Marseille by Théophile Berthon is a real moment of gluttony thanks to the successful selection of its ingredients. 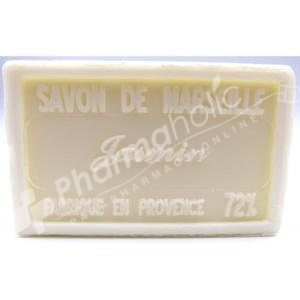 Théophile Berthon Marseille Soap Harvest Fruit can be used on sensitive skin thanks to its naturally sweet formulation. It contains a concentration of 72% of plants including olive oil and shea butter. It is made in Provence with the collaboration of the perfumers of Grasse. Its delicate fragrance is born from an association of essential oil and perfume. It is manufactured according to traditional methods for a greater respect of the selected ingredients. Gently cleanse your skin whilst enjoying the fruitful relaxing odor. Sodium Palmate, Sodium Palm Kernelate, Aqua, Parfum, Glycerin, Butyrospermum parkii butter, Palm kernel acid, Sodium Chloride, Tetrasodium Etidronate, Tetrasodium EDTA, CI 77891 ; CI 11680, Benzyl Alcohol ; Benzyl Benzoate; Hexyl cinnamal ; Hydroxyisohexyl 3-cyclohexene carboxaldehyde; Linalool; Amyl cinnamal; Hydroxycitronellal; Benzyl salicylate.